This list is a follow-up to my post, Adobe Premiere Pro CS6.5 Wish List (FCP switcher). Well, as we all know, CS6.5 never materialized because Adobe switched to a new, subscription-only release model. I won’t get into that except to say that I’ve been a Creative Cloud member from the start, and it’s currently worth it to me. Adobe Premiere Pro CC is a solid upgrade over CS6 and great fit for FCP7 switchers. Premiere CS5.5 was not ready for prime time either, however, but Adobe recognized that Apple had left the door open to a large contingent of disgruntled pros. Adobe shifted more resources into Premiere development and actively sought out the input of the Mac creative community. Ironically, this is something that Apple did not and does not do, an attitude that makes sense for “dumb consumers” but not — let’s just say for example — a professional user who can catalog the 88 features that would make his working life easier. A result of Adobe’s new focus, Premiere Pro CS6 was a major upgrade over CS5.5. Yet, when my FCP7 colleagues would ask if Premiere was the way to go, I could only say that they would probably like it better than FCPX, but that a few things would undoubtedly drive them crazy, namely track targeting in the Timeline. At this point, I recommend Premiere Pro CC to Mac users who must inevitably say good-bye to the venerable and rapidly graying FCP7. It’s not quite what Final Cut Pro 8 could have been, but it’s close. Of course, I am extremely picky when it comes to the software I use for work (okay, any software). So it won’t be long before I publish my new list of Premiere Pro CC gripes, but Adobe has put a big dent in the list I started the day I downloaded CS5.5. I’m looking forward to more frequent updates through Creative Cloud. I give this a “neutral” because moving forward, it looks like Adobe will support hardware acceleration in high-end Apple hardware whether equipped with AMD or NVIDIA GPUs, but if your current system’s AMD card is not supported, don’t hold out hope that it ever will be. In my original list, I called this a bug because I figured there was be no way it could be intentional behavior. After two major updates, I now realize that it’s not a bug. It’s just weak implementation. There is no persistent cache for thumbnail images in the Timeline. The images get recreated every time a project is opened. This is also the case for bin thumbnails, although that may have something to do with hover scrub. In Final Cut Pro 7, you could set the thumbnail image disk cache size, and I would set it high enough that I could go back to a project months later and still have thumbnails load instantly as I scrolled through the Timeline. The only real limitation was the memory setting for the cache, which had to stay pretty low in a 32-bit app, but that shouldn’t be a problem in a 64-bit app. If you set your Timeline for continuous thumbnails, Adobe’s behavior is extremely annoying in a long sequence. It slows you down. I understand that the thumbnails may have to regenerated after changes to track size or as clips are adjusted, but a RAM cache already exists (or else thumbnails would get regenerated every time you scrolled, which is not the case). So save it to disk! It won’t take up much space. This gets a double check mark because it’s huge. Track patching has been vastly simplified and improved. It’s much more like Final Cut Pro 7, only more customizable. The first time you see the message that Premiere Pro has encountered “a serious error” and has to shut down, you assume from the tone that it is a rare circumstance and that the authorities have been notified. But this error and other fatal errors are flat out common. They can happen at any time, and when they do, I find myself Googling “what’s new in FCPX” and start to wonder if I’ve made a mistake. In Final Cut Pro 7, I expect even the oldest project files to open painlessly and have been rarely let down. I frequently create temporary bins for copies of “maybe” clips. In Premiere, I can’t clean up those bins, i.e. delete them, if I end up using even just one of the clips. This really becomes a problem because of the way I create iterations of sequences. I regularly copy my current sequence and drop it in a bin called “incremental”, sometimes renaming it to indicate the most recent changes. That way, when I screw something up down the line, I can go back to that sequence. Auto backup is great in emergencies, but it does not give me that kind of control or freedom to experiment. Those sequences add up though and suddenly I can’t remove a clip from a bin because it was used in some early draft. This is all part of a bigger problem, though, which is the whole master file versus instance versus subclip versus dup clip thing. There aren’t any good indicators regarding the relationships of these clips, and there are few ways to adjust them. Update: Adobe added the ability to import assets and timelines from other projects in CC. It would still be nice to be able to work on more than one project at once without having to re-load all the media. However, the most common reason for opening multiple projects is probably to copy over assets or sequences, in which case, the Dynamic Link project import is actually a more powerful feature. So I’ll check it off the list. Until I can preview any sequence full-screen at full-res with multiple effects, rendering will be part of my workflow, and therefore background rendering would be beneficial. I don’t mind dropping the playback to low resolution temporarily as my footage renders, but I shouldn’t have to export an entire project to preview it at high res. Quality hardware is an important investment, but requiring everyone to work on pimped-out towers (or cylinders) is not the answer. Sometimes, the available hardware is not your call, and there are many jobs where being able to cut on a laptop is crucial. I have found this to be the case with large corporate events where work areas are often set up quickly, sometimes in tight corridors, and subject to change. There are many other forms of production where mobility is even more important. Also, with each bump in processor power comes a new, more demanding codec. Adobe’s solution for editing several forms of raw, such as CinemaDNG, is to use a proxy format. What? This completely upends their no intermediate codec ideology. And now 4K is here. I do believe there should be a choice in the way that background rendering initiates. Per the user’s preference settings, background rendering should start: automatically (instantly), only through manual initiation, or during idle time. Put more simply, “background rendering + smart rendering” would be awesome. Adobe did make a very important upgrade to smart rendering in CC. Smart rendering and the “use preview files” export option now work with Apple ProRes. This is huge for those of us who are accustomed to the Final Cut Pro 7 workflow. Yet, by adding ProRes smart rendering, Adobe is acknowledging that rendering as you work is a legitimate Premiere workflow. Of course it is, because it can save substantial time when exporting, especially when it comes to re-exporting after making minor adjustments in the Timeline. You can now select a range of clips directly in the Timeline to render. I give this a “neutral” because the newest Macs have HDMI outputs and Thunderbolt, but it’s still a major problem on my iMac. I accept that a third-party card is required for the most accurate color correction on an external display, but there’s no reason this ability shouldn’t exist as it does in both FCP7 and X (with a simple adaptor). It’s surprising that such a fundamental element of Premiere is still so unrefined. The cursor icons for the various editing tools are too big, too imprecise, and just ugly. The trim tool and the ripple tool should have different shapes that indicate their function, not just different, non-semantic colors. Update: “Leaner trim icons” added in CC 7.1. That’s a nice improvement, but the trim and ripple tools should still have different shapes rather than just different colors. I’m going to give them this one only because the Timeline head has been so drastically improved. Clicking near a cut with the trim tool highlights it in such a way that it blocks other edit tools, such as the ripple edit tool, from working on the edge of the adjacent clip. You have to unselect by clicking somewhere else in the Timeline. I could be imagining things, but I think they got this one. It used to be that when you zoomed out on strings of short clips, it was hard to click on the middle of an individual clip to select it (partly due to those those bulky tool icons). I think they shrunk the hover area around the edit point, which is a nice improvement. Much better! It used to be very difficult to discern what, if anything, was selected in the Timeline. Transitions always looked selected! I thought this was a bug, but it might just be a manifestation of problem #14. The timeline looks significantly more polished with a variety of options. This was something they really fixed in CS6. The up and down arrow keys replaced CS5.5’s page up and page down keys as the previous/next edit navigation controls, freeing the paging keys to, get this, page through the Timeline. Much more importantly, they added the ability to skip to the next edit across all tracks (by using shift-up and shift-down), as opposed to whatever track happened to be selected at the head of the Timeline. With the introduction of Creative Cloud preference synching, this little nuisance has become…littler. So count it! It’s hard to believe they haven’t fixed this yet. When you double-click a bin, it always opens a small, default-size window. Pretty basic. Having to hide the mouse pointer in the corner is pretty irritating. After renaming a clip, you have to click on the column name (twice really), to get it to sort. The FCP way was much more useful. The color boxes in a separate column all blend together. They don’t allow me to really highlight clips or make much use of color coding at all. Also, what’s with the default color names? Righ-clicking on a clip gives you a list of exotic names without any visual indication of the label’s color. Always. Copy is currently command-drag in the Project panel. They fixed this in a point update to CS6. Previously, while working in other apps, Premiere would force itself into the foreground to show that it was performing an auto save. This was especially disruptive because Premiere keeps performing auto saves even if nothing has changed since the last one (see gripe #28). It appears to until you’re not in the middle an adjustment now. Classy. Ideally, the auto save would just be a background function. This gripe should have been split in two, but as of the first update to CC, they got them both! In FCP7 I set the number of auto saves to the maximum of 100 and Premiere can go even higher. I have always used this feature as an additional backup and archive system, which has come in very handy. Those files add up, however. So, I wish I could set up Premiere to auto-save to an external drive. Rather than delete the oldest auto save file once it has reached the limit set in the preferences, auto save starts reusing the same set of file names. This makes it unnecessarily difficult to determine which file is the latest version. If you move the CTI while it’s in play mode, it should continue to play from that spot after you release the mouse, not stop there. This isn’t a minor thing. It’s the way I audition cuts. If this would bother long-time Premiere users (if such a thing even exists), make it a preference. They may have sped this process up. I will re-evaluate after I’ve worked on some bigger projects. I’m sure this comes back to the lack of supported hardware acceleration on so many Macs, but scrubbing is pretty awful. While this is understandable with native footage, FCPX is silky smooth at full resolution. I give it a “neutral” because it seems to have improved somewhat and other reviewers have raved about the speed on systems with hardware acceleration. You can now increase the limit to 100 in the preferences. That’s a big improvement. I challenge them to get it to 1000. Clips in the Timeline now sport an “Fx” indicator that turns orange when effects have been applied. I would take it a step farther and add better visual indicators to the effect panel itself as to what specific parameters have been adjusted. This would allow you to edit more quickly when effects are forcing you to render after every cut. In cleaning up the 3-way color correction effect in CS6, Adobe took my advice almost to the letter. (Yes, I take full credit!) They put the most important adjustments up top and replaced the confusing highlights/mid-tone/shadows drop-down selector with three dedicated wheels. However, a simple shape mask is sorely needed. I find masks are much more useful and ultimately faster than relying on shaky ranges that rarely nail skin tones with any precision. Basic color correction is one of the things that Apple really got right with FCPX. Speedgrade and DaVinci Resolve are great for big projects, but I shouldn’t have to leave the NLE for color correction as often as I currently do. I guess the pitch change is intended to mimic linear editors, which was fun for a few seconds, but I have a much easier time navigating dialogue with the stutter-style scrubbing. I’ve changed this from an X to a dash because it is possible to set up a keyboard shortcut for “Add Clip Marker”. I have chosen control-m. This works, but it would be much more intuitive to have “m” mark either all selected clips under the CTI or the timeline if no clips is selected. Also, Add Clip Marker is extremely buggy with merged clips. It doesn’t always work and sometimes even causes Premiere to freeze up, requiring a Force Quit. This may be related to the fact that Match Frame for merged clips is broken in CC as well. Lastly, sometimes the Clip Marker is visible only on the audio track and not the video track, which is very odd. Update: Ability to apply markers directly to clips was added in CC 7.2, which is nice, but Clip Markers still aren’t visible if a video track is collapsed, which is very annoying. Adobe Anywhere may cover this and more, but it requires a disappointingly complex, expensive, custom-built hardware configuration. Truthfully, I don’t remember exactly what my problem was with this and haven’t had much chance to test it out in CC. They fixed this somewhat. It no longer cuts off buttons the way it used to, but it still doesn’t even center! Do I need to teach them some CSS? This gets a “neutral” because I’ve gotten used to clearing keyframes and reseting the overall effect separately. Update: They added reset buttons for all individual parameters in CC 7.1. Nice! You would think Match Frame would accomplish this, but it opens a different instance of the clip. Also Match Frame for Merged Clips is broken in CC. A preference has been added to address this. Peak file generation can now be turned off in the preferences. I don’t know if there are still problems with the files getting disconnected, but the whole process should be invisible to the user. Fine. Call them “rectified” if it makes you feel superior. Looking good though. Now that the blade tool has snapping in CC, I can live with this, but it’s still annoying. Update: Added in CC 7.1. This is much more convenient, but instead of updating one function at a time to respect clip selection, just ditch track selection all together for a consistent experience throughout the interface. Update: Added in CC 7.1. I don’t know what the top speed was before, but it wasn’t very fast. Now you can get up to 32x, which is about as fast as you would ever need to go. Well done! The grave accent window maximize is a truly awesome feature. So yeah, I know, pressing it once maximizes. Pressing it again snaps it back. Don’t ever lose that behavior. But I get used to hitting “Esc” to leave full screen mode. I would consider it a personal favor if that button snapped-back maximized windows as well. Here it is: “Ctrl+Shift+” to tab left and “Ctrl+Shift+.” to tab right. I will probably switch the second one to Ctrl-tab but all right! I would rather it not take pit stops at the tool and audio level panes though. I don’t yet know if this bug has been fixed, but merge clips is definitely still buggy. Match Frame is now broken, and syncing audio by waveform analysis has yet to work for me. Merged clips have been very buggy since their introduction. They fixed this in a CS6 point update. “Return” now moves to the next line. “Enter” simply enters. This got fixed in a CS6 point update. So they went with a darker shade instead of a lighter shade just to make it look like they weren’t stealing all of my ideas, but it’s a nice improvement in addition to the prettier waveforms. “Cmd-,” (that’s command-comma) and “Cmd-.” (command-period) should cause a clip collisions, not overwrite, because a good use of those keyboard commands is to slide a clip up to but not over the adjacent clip. They call it a nudge. That works. This was added in a CS6 point update. Nice. You almost missed out on a check mark here, Adobe! You can now right click on an edit point and select “Join Through Edits”. I’m not sure why it’s plural, but more importantly, in order to see the through edit indicators, you need to select “Show Through Edits” in the Timeline settings. Why this wouldn’t be on by default is beyond me. You could then use the shift-drag technique if you want to choose a different track for the audio. Done. But there should also be an option to reset the cache/render file locations to their defaults. In CS5.5 you had to create a black matte. In CS6 they added “Black Video”, but it still involves an extra step to take it from the Project panel to the Timeline. The online support documents on the Adobe site are actually very good at this point, and Adobe employees are also active in the support forums. Try finding an official representative of Apple in a support forum. If only Apple had just added these features and others to the FCP7 framework instead of reinventing the wheel and taking the train “off the tracks” in the process. Adobe can do it better by using smart folders in addition to the traditional bins that we know and trust (anything besides those dreadful iMovie-style “events”). There has to be a quicker way to preview effects, perhaps along the lines of the Lumetri Looks preview thumbs (minus the guy with the mohawk). Theoretically, you can now automatically sync and merge clips by audio waveform analysis, but it has yet to work for me. And let us set the default directory. Some very basic effects are missing: vignette, border, and motion blur to name a few. Adobe’s stock response to this has been to use After Effects or Photoshop. Round-tripping with Dynamic Link is a great option, but I see no reason that more effects shouldn’t be built it. Obviously, Adobe sees the benefit of including effects within Premiere or they would provide zero. Lumetri Looks. Cool. Keep them coming. You can always use more speed. I’ll revisit this with my next hardware upgrade. I saved this one for last because it has absolutely no impact on my ability to edit, but I’ve always found the unrefined appearance of the CTI amusing. They wisely dropped the rudimentary 2-frame animation that existed in CS5.5 and earlier, but it still looks like a crappy gif icon. I have no doubt. I think FCPX actually got a lot of things right. I love its color correction scheme. The problem is that a few of the things I don’t like about it are major and baked into the core of the system. I don’t know if I could get used to the trackless timeline. Maybe. But the auto save routine and the way it organizes projects and media drive me insane. Making it work with shared media seems like a nightmare. I feel much more in control with Premiere. When I first tried CS5.5, I was somewhat astounded by how many dumb little problems it had for a mature program. 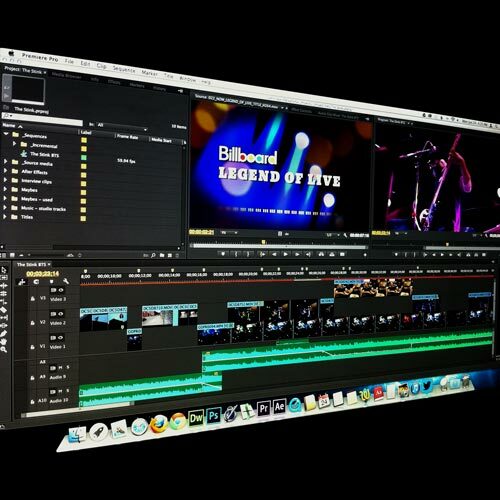 Yet, I thought it had more potential to be a true, professional-level successor to FCP7. It definitely seemed that Adobe was more interested than Apple in actually listening to what editors needed. Premiere has improved by leaps and bounds with CS6 and CC. If they address stability concerns and background rendering, my list would consist mainly of minor irritations — not that I consider any irritation minor or I wouldn’t spend time on these posts! I know what you mean. I was an FCP7 / PP guy before I finally gave in to FCPX. It was a tough transition, but I can’t even touch Premiere now. For me, the gripe you mention about more effects and having to roundtrip with After Effects was big for me. There are certain times when that is acceptable. But it really is an old paradigm and in my opinion should be limited to effects shots. I shouldn’t have to link into After Effects to add a vignette, as you mention. The killer feature of FCPX is the one that I think a lot of people overlook. And that is the integration with Motion. I can’t tell you how much time I’ve saved by building my own animated titles and effects in motion, and then using them (with complete customizability) in FCPX. I think PP is great for people who want to stay in the “FCP” paradigm… working on one project at a time, tracks, etc… But if you can take the time to wrap your head around it, FCPX really is amazing. Great list, as a long-time Premiere user i’ve become so used to some of the crappy ways things work that it’s nice to see a fresh perspective picking apart the things that they don’t like. Helps me revisit my techniques and improve my workflow knowing what has been addressed from others perspectives. RE: Clip Markers – You have been able to add marks to a clip in the timeline since CS6 and still can in CC. It’s a bit buggy in my opinion, but if you go into keyboard shortcuts, the TIMELINE PANEL you’ll see ADD CLIP MARKER. You also have to make sure SHOW CLIP MARKERS is enabled in the timeline display. THe clip does have to be selected in the timeline for the markers to be added though. Also, thank god, in this update you can now jump between clip and timeline markers in the timeline. in CS6 you could only jump to timeline markers, which made clip markers pretty useless. Thanks. Yeah, it’s very buggy, actually. Sometimes the “Add Marker” button works while the “m” key does not. Other times, it doesn’t work at all. In other cases, the mark appears on only the audio track, which is strange and unfortunate. The audio track isn’t alway visible when I’m trying to match up a clip marker with a timeline marker. You’re right about jumping between clip and timeline markers now. Good point. What I would like to see is this: If I select a clip and press “m”, it should mark the clip at the CTI, without having to open the clip in the Source viewer. If no clips are selected at the CTI, it should mark the timeline. Edit: After a discussion in the forums, I discovered that you can set up a keyboard shortcut for “Add Clip Marker”. This is not as elegant a solution as the above, but it’s okay. Unfortunately, there’s a major bug when it comes to merged clips. Attempting to add a marker to a merged clip actually causes Premiere to freeze in my experience, requiring a Force Quit. This may be related to the Match Frame bug. As many users have reported, Match Frame is often unable to match the proper frame when applied to merged clips. Merged clips were extremely buggy in CS6. The trend continues. Great list. I hope someone at Adobe is paying attention. I send them 5-10 bug reports and “wishes” a day. FYI, #37 was fixed with today’s update. Thanks! I haven’t found that to be the case with #37 though. When I undo, the CTI stays put, even after multiple undos. It would be helpful if it moved back to wherever it was at the point of each step, especially if I’ve scrolled to another segment of the Timeline. Strange; on my system the undo behaves as ‘expected’ now … even after multiple pastes, moving around, etc. Interesting. I wonder if there is a preference setting that affects that behavior, although I don’t know what it would be. Are you Mac or PC? I’m on Mac 10.7.5. You? 89. After pasting clips in a sequence, they should be selected (for deletion, modification, whatever.) I shouldn’t have to manually re-select them all. This is standard behavior on all apps, including Adobe. 90. There should be a shortcut for “Reveal in Finder” from the Timeline. It’s in the context menu (right click) for Chrissake! 91. Opening an item from the Project window via shortcut (e.g., ) should open in Source or Program depending on its type. If it’s a clip, open in Source. If it’s a sequence, open in Timeline! 92. Scrub Audio Toggling has been buggy since CS5, I believe, and it’s still buggy. If you toggle it via shortcut, the toggling does not occur until you either (a) play video, or (b) move around with mouse. If you try to toggle it while moving around with keyboard, it just has not effect. I wish they would make it like Avid, where if you scrub with keyboard while holding down it temporarily scrubs with audio. 93. There’s a bug where half the time I simply cannot delete an effect from the Effect Control panel. Neither nor nor will get rid of it. 95. After I Undo, the clips which were selected before my last action should still be selected! E.g., If I select a bunch of clips, then hit , when I meant to hit , and then Undo, I now need to manually re-select all those clips again. Major PITA. 96. Nearly impossible to select a cut for trimming when it’s “under” a transition effect icon. You have to grab a 1-pixel region near the edge. Annoying. 97a. Can’t change font size of text if it contains different sizes. (You can in Ae, Ai, Ps, etc.) You should be able to enlarge a bunch of text and have the characters maintain their RELATIVE size. 97b. How the heck do you exit the Titler with shortcut?? closes each panel individually. 97c. Shortcuts to change leading should be the same as in Ae, Ps, Ai, etc. Not the bloody OPPOSITE. 98. Need a way to batch export several sequences. Takes forever to queue up a bunch in AME. 99. Need a shortcut to switch through panels in a single frame. E.g., If I have many timelines open, why can’t I flip left or right through them, like in Ae? PLEASE, ADOBE, DO THE RIGHT THING! Wishlist for this blog: 1. Ability to edit comments. I fixed the Ps. I plan to upgrade the commenting functionality of this blog when I have the time, but your packafoma.com feature request is noted! C’mon adobe, it will be very nice if you deal with it.